Whether you have to make room for your new shed or just want to get rid of a backyard eyesore, you need to know how to remove a shed. You can pay for professional shed removal and have it hauled out with a truck — or you can take the DIY approach and take the shed apart piece-by-piece. At Glick Woodworks, we’re your shed experts. Not only do we build high-quality Amish storage, but we also teach our customers everything they need to know about sheds. In this case: how to remove them. Read our latest blog to learn how to remove a shed, step-by-step. Any professional shed removal company worth its salt will use a truck or a mule to simply remove the old shed off your property. However, as a homeowner, you don’t necessarily have access to that kind of equipment. Get a Dumpster or Other Storage for Your Debris — Trust us, you’re going to need to have somewhere on site to keep the remnants of your shed. Taking your shed apart can make a mess and leave you with quite a few big pieces to dispose of. Cut Off the Roof — When removing your shed, starting with the roof is your best bet. Tearing off shingles on a roof one-by-one is too time-consuming. Instead, we recommend using an old saw blade to cut off large sections of the roof. Try to get the entire roof cut apart in two or three sections. While cutting through the shingles is fairly easy, the tar will damage the saw blade, so use an old blade you don’t mind throwing away. Cut the Siding near the Corners — This is a crucial step when learning how to get rid of a storage shed. Cutting through the sturdy 2X4 posts will be challenging. Instead, you’ll want to separate the siding from those posts. Make large, vertical cuts at the shed corners next to the 2X4 posts. This should make the shed walls easier to remove. Push Down the Four Walls — Once you’ve weakened the support to the walls, you can push them over by hand. This saves you from having to saw through the siding itself and leaves the siding mostly intact. You can then drag or hoist the walls to your dumpster. Just be careful to not shatter the windows when pushing over the walls — if you do, you’ll need to promptly and safely clean up the glass. Demolish the Shed Frame — While the pressure treated 2X4s making up the shed frame are tough, you’re going to have to bring them down eventually. Make smart cuts and try to separate the frame from the floor. Breaking the frame into pieces makes your job easier. If your frame is rotting, it’ll make this step easier — tearing down your shed is the only time it’s good to see it rotting! Cut the Floor into Pieces — Once you’ve removed the shed frame, all you’ll be left with is the floor. Pull up the floorboards first and then demolish the underlying floor frame. While this step is hard work, it isn’t too complicated. Just keep going and you’ll have your shed demolished before you know it. Rake the Yard to Pick Up Loose Debris — Now that you know how to remove a shed, all that’s left is the cleanup. Since the shed demolition process can leave some debris throughout your yard, you’ll want to rake your lawn to make sure you get it all. Remember: Safety first when demolishing your old shed by hand — be on the lookout for rusty nails and other sharp objects. At Glick Woodworks, we have a long history in the shed business. 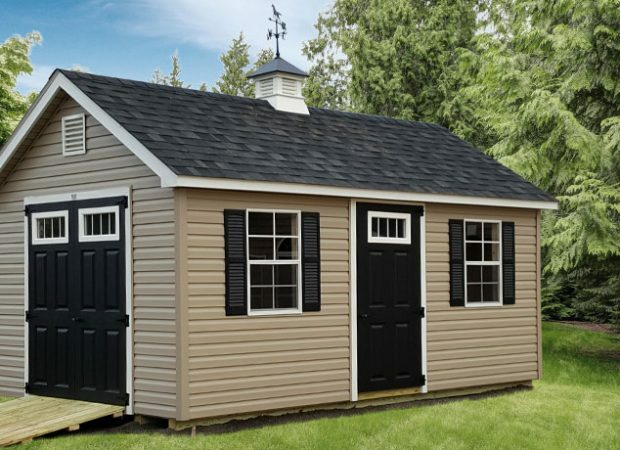 We build and install custom sheds throughout Pennsylvania, Maryland, and New Jersey. In addition, we also include shed removal as a value-added service for our customers. 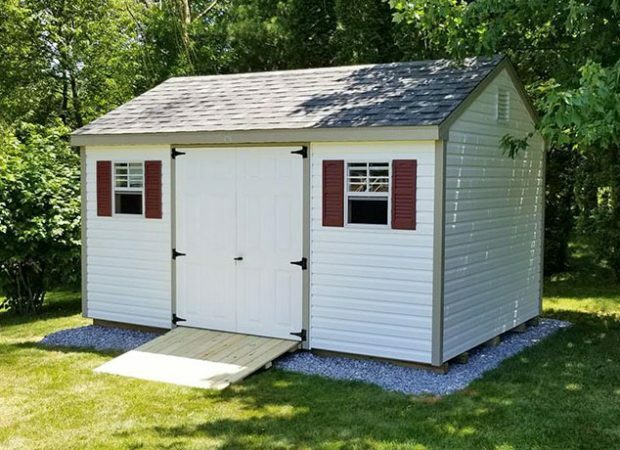 Although you can try your hand at the DIY option, most homeowners find it much easier and more convenient to include expert shed removal with their purchase of a brand-new storage shed. 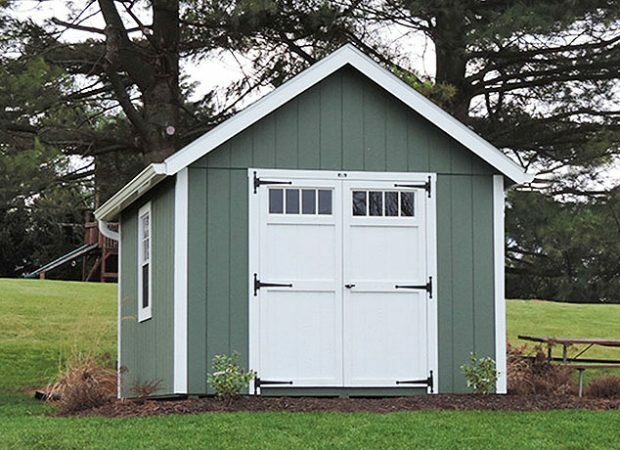 See our gallery of shed styles. Glick Woodworks is known throughout our hometown and beyond as a builder of high-quality Amish sheds and garages. If you’re looking to replace your old shed with a brand new one, we’re the company to call. Read our blog on how to pick your new shed — or contact us today to start discussing your options! Contact Glick Woodworks for Professional Shed Removal! "We were impressed with the knowledge and expertise of owner and employees. Quality of workmanship was excellent."